Shared Madness began with an immense debt. For eight years, the violinist Jennifer Koh - "a prodigious builder of musical bridges," according to the Los Angeles Times - struggled to pay off the loan she had taken for her instrument. At one point, she even considered declaring bankruptcy. While teetering on that brink, however, she met Justus and Elizabeth Schlichting, patrons who agreed to take on her debt in exchange for new commissions for Koh and her violin. They got an astounding thirty-two new works. 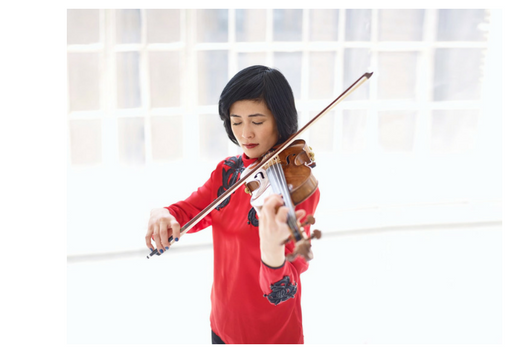 Debuted during the New York Philharmonic's Second Biennial, the two concerts of Shared Madness includes thirty-two short pieces from composers whom Koh considers her friends. It is a marvelous study of violin virtuosity for the twenty-first century, inspired by Paganini's Caprices. At the first concert at Duke's 200-seat von der Heyden Studio Theater in the new Rubenstein Arts Center, there is Julia Wolfe's breathless Spinning Jenny; Vijay Iyer's quixotic Zany, Cute, Interesting; and Gabriel Kahane's playfully metatextual The Single Art Form Is Dead. The second concert introduces Philip Glass' stately take on the sarabande form; Michael Gordon's electrifying kwerk; and the howling Palimpsest Capriccio, written by maverick French composer Jean-Baptiste Barrière. Each of these two concerts is ticketed separately.